After years of cooking it wrong, I finally learned from Cook’s Illustrated how to make perfect oven roasted asparagus. Thanks to Cook’s Illustrated test kitchens, I now know the secrets to perfect oven roasted asparagus. After reading the test kitchen method, I realized that I’ve been doing it wrong for years! Cooksillustrated.com is a subscription based site that is replete with recipes, taste tests, kitchen equipment reviews and more. The CI test kitchens do exhaustive recipe tweaks until they find the best way to cook everything. Thus, this asparagus method! I used to roast asparagus at 400 degrees for 10-12 minutes. Most often, the stalks would be more soft and limp than crisp-tender. Cook’s Illustrated recommends two things regarding temperature: 1) Turn the oven to 500 degrees and 2) preheat the baking sheet before adding the asparagus. Choose asparagus with fairly thick stems, as pencil thin spears tend to wilt during cooking. Wash asparagus early in the day and keep in the fridge until cooking time. A few hours in the fridge will yield dry spears that will crisp more easily (wet spears tend to steam). Gently bend the tough ends of each asparagus spear, and the ends will easily break off at the right place on the stem. Place the spears in a flat, shallow baking dish to toss in the extra virgin olive oil. High quality EVOO makes all the difference, and it doesn’t have to be expensive. Read this post on the best supermarket EVOO’s. Make ahead: Roasted asparagus can be served freshly roasted and hot, but it is also good chilled. 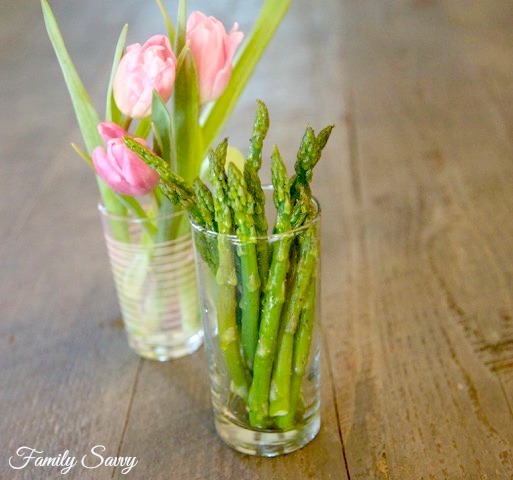 A fun way to serve chilled asparagus is in individual juice glasses~treating it as an appetizer or salad course. If you try this “higher heat” method for roasting asparagus, I’d love to hear your thoughts. Do you think it makes a difference? Leave comments; I love hearing from readers! As always, thanks so much for stopping by. Be blessed, and stay savvy!!! Preheat oven and baking sheet to 500 degrees. Break tough ends off of asparagus spears. Rinse asparagus and dry completely. 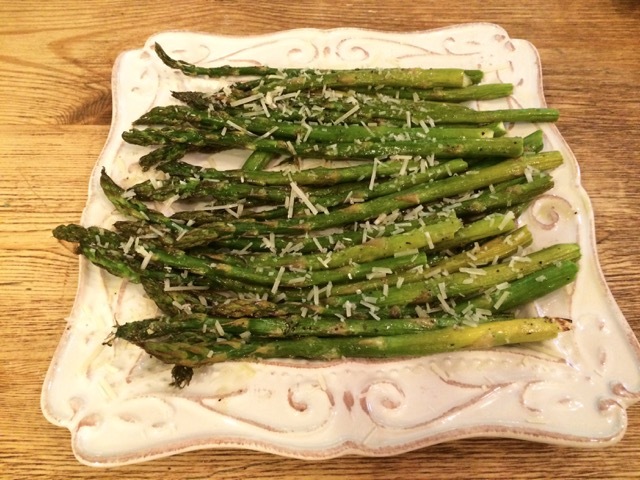 Toss asparagus in EVOO, salt & pepper, coating well. When oven and baking sheet reach 500 degrees, remove baking sheet. Spread asparagus on baking sheet; return to oven. Bake for 8-10 minutes; remove when asparagus just begins to brown on edges. Arrange on serving plate; sprinkle with freshly grated parmesan. I really like the time i save i do lemon juice, butter and garlic! Sorry trying to nurse my son and can’t type very easily! Enjoy! Sometimes I substitute with lemon pepper seasoning or you can score a lemon over it with badia complete seasoning and I still add minced garlic!